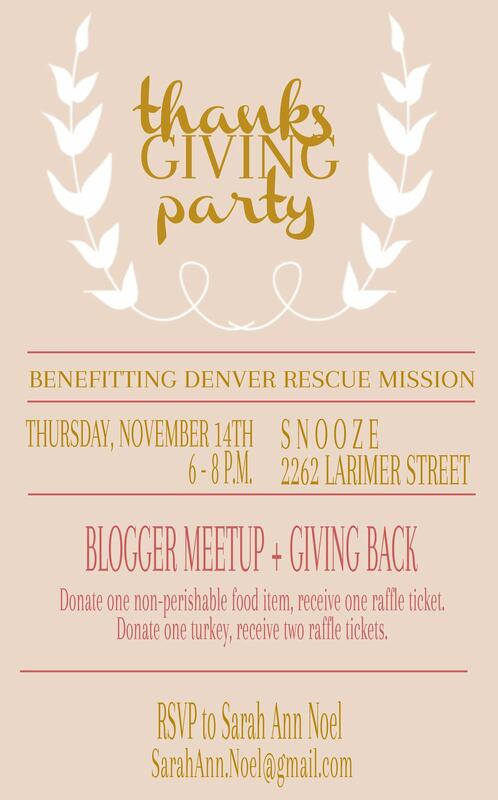 So when I sat down with Aneta, Hannah, and Sarah to brainstorm ways we could help Denver Rescue Mission with its holiday giving campaigns, one of the first ideas we came up with was a party. That's right, we're throwing a party AT SNOOZE. And there will be food and drinks and prizes and probably the most fun you could possibly have on a Thursday night. Maybe there will be a bit of Michael Jackson and some dancing. You'll have to come to find out. While we plan on having a roaring good time (duh), we also plan to do some serious good for one of our city's most important non-profit organizations. We'll be collecting Thanksgiving food items in exchange for raffle tickets - and the raffle prizes are gonna be awesome. What are you waiting for? Mark your calendar and send Sarah an email to get yourself on the list!